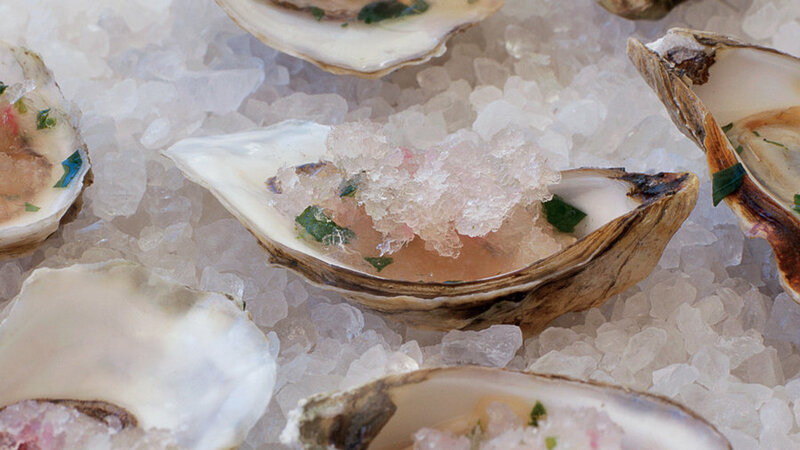 This sparkling, vodka-laced granita has a peppery kick that sets off the briny sweetness of a good West Coast oyster. Prep Time: 15 minutes, plus 3 hours of freezing time. Notes: You can make granita up to 3 days ahead. Re-rake with fork before serving. Also, if you’re serving the oysters on a buffet, serve on crushed ice with the granita in a bowl alongside, also on ice. Combine all ingredients except rock salt and oysters, pour into a loaf pan (to a depth of about 1 in. ), and freeze 1 hour. Rake and crush mixture with the tines of a fork and freeze for another hour. Rake and crush mixture again and freeze 1 hour more. Spread rock salt on a platter. Rake and crush granita a final time into fine crystals. Set oysters in place and top each with a spoonful of granita.